Mutations in the gene encoding for dysferlin cause recessive autosomal muscular dystrophies called dysferlinopathies. These mutations induce several alterations in skeletal muscles, including, inflammation, increased membrane permeability and cell death. Despite the fact that the etiology of dysferlinopathies is known, the mechanism that explains the aforementioned alterations is still elusive. Therefore, we have now evaluated the potential involvement of connexin based hemichannels in the pathophysiology of dysferlinopathies. Human deltoid muscle biopsies of 5 Chilean dysferlinopathy patients exhibited the presence of muscular connexins (Cx40.1, Cx43 and Cx45). The presence of these connexins was also observed in human myotubes derived from immortalized myoblasts derived from other patients with mutated forms of dysferlin. In addition to the aforementioned connexins, these myotubes expressed functional connexin based hemichannels, evaluated by ethidium uptake assays, as opposed to myotubes obtained from a normal human muscle cell line, RCMH. This response was reproduced in a knock-down model of dysferlin, by treating RCMH cell line with small hairpin RNA specific for dysferlin (RCMH-sh Dysferlin). Also, the presence of P2X7 receptor and the transient receptor potential channel, TRPV2, another Ca2+ permeable channels, was detected in the myotubes expressing mutated dysferlin, and an elevated resting intracellular Ca2+ level was found in the latter myotubes, which was in turn reduced to control levels in the presence of the molecule D4, a selective Cx HCs inhibitor. The data suggests that dysferlin deficiency, caused by mutation or downregulation of dysferlin, promotes the expression of Cx HCs. Then, the de novo expression Cx HC causes a dysregulation of intracellular free Ca2+ levels, which could underlie muscular damage associated to dysferlin mutations. This mechanism could constitute a potential therapeutical target in dysferlinopathies. Dysferlinopathies are muscular dystrophies caused by mutations in dysferlin, a 230 kDa membrane protein, mainly localized in the sarcolemma  and the T-tubule system [2, 3]. It is accepted that dysferlin participates in membrane resealing after damage [4, 5]. This protein is weakly expressed in myoblasts (myogenic precursor cells), but highly expressed in adult skeletal muscle . Clinically, dysferlinopathies manifest between the second and third decade of life in previously asymptomatic patients. At onset, most patients refer weakness in the lower extremities, difficulty in running or climbing stairs, sometimes accompanied with pain . Regarding the alterations produced by dysferlin mutations in muscle, prior reports have detected the presence of inflammation [8–10]; disruption of the T-tubule structure, which in turn was ameliorated by reduction of external [Ca2+] or blocking of L-type Ca2+ channels with diltiazem , suggesting that a deregulated entry of external Ca2+ may underlie damage in dysferlin null myofibers. In addition, an altered permeability to dyes such as Evans blue has been reported in skeletal muscles from Dysf-/- mice (an animal model of dysferlinopathy) , and previous reports have demonstrated that Evans blue crosses the cell membrane through Cx HC . Hence, these results strongly suggest the presence of connexin based hemichannels (Cx HC) in the sarcolemma of myofibers from the animal model. As we previously reported, the de novo expression of Cx HCs has been observed in similar pathologies, where they mediate myofiber atrophy induced by denervation . Interestingly, only a mild muscular atrophy was observed after denervation in Cx43 and Cx45 KO mice . Since Cx HC are non-selective channels permeable to ions (e.g. Ca2+ and Na+) and small compounds, including signaling molecules such as ATP and NAD+ and dyes including ethidium (Etd+) and Evans blue [12, 13], the altered membrane permeability caused by the Cx HC expression could contribute to the development of the muscular atrophy. Indeed, the de novo expression of Cx HCs promotes the increase of oxidative stress in pathological conditions such as muscle denervation  and they constitute a mechanism of ATP release in several muscle pathologies [11, 12, 14]. To date there is no effective treatment to arrest or even reduce the symptomatology of the patients affected with dysferlinopathies. Nevertheless, the introduction of a mini-dysferlin in animal models of the disease (Dysf-/- mice) results in the recovery of membrane resealing function. However, the progressive degeneration, ascertained from muscle histology studies, remains unabated . The aforementioned evidence points to the existence of an additional pathological mechanism, triggered by the absence of dysferlin. In the present work we evaluated whether myotubes of patients suffering from dysferlinopathies, as well as in other in vitro models of dysferlin deficiency, express Cx HCs and whether the expression of these types of channels alters the sarcolemma permeability, and increases intracellular free Ca2+ in these cells. We analyzed the presence of connexin proteins by immnunofluorescent microscopy in human muscles biopsies from patients bearing dysferlin mutations (see methods for dysferlin mutations), the absence of dysferlin was confirmed by immunohistochemistry assays (data not shown). As shown in Fig. 1, connexins 40.1, 43 and 45 (green signal, Fig. 1) were detected in biopsies from patients with dysferlinopathy but not in biopsies of control subjects (control). These proteins colocalized with the plasma membrane protein spectrin (Fig. 2) , indicating that all three connexins are present in the sarcolemma. Using immunofluoresence, we next evaluated the presence of the purinergic receptor P2X7 and the transient receptor potential cation channel subfamily V member 2 (TRPV2), which have been previously associated with muscular atrophy . P2X7 receptors were detected in one of the two patients evaluated, whereas TRPV2 was found in the biopsies of both patients (Fig. 3). Conversely, in control patients (patients without a muscular pathology) both receptors were absent (Fig. 3). Because Ca2+ influx is reportedly increased in human muscles bearing dysferlin mutations , we evaluated the presence, in human dysferlin-mutated myotubes (HDMM) (using immunofluorescent miscroscopy), of different Ca2+ channels; connexin-based hemichannels, transient potential receptor TRPV2 and P2X7, all of which have been previously linked in muscular pathologies [11, 12, 18]. We observed the presence of Cxs 40.1, 43 and 45 in all HDMM, although they have different dysferlin mutations (Fig. 4, green signal), they were absent in normal myotubes (Control, RCMH cells). On the other hand, TRPV2 channels and P2X7 receptors were only present in 107 and 379 (dysferlin-mutated cell lines, see methods) derived myotubes (Fig. 4). 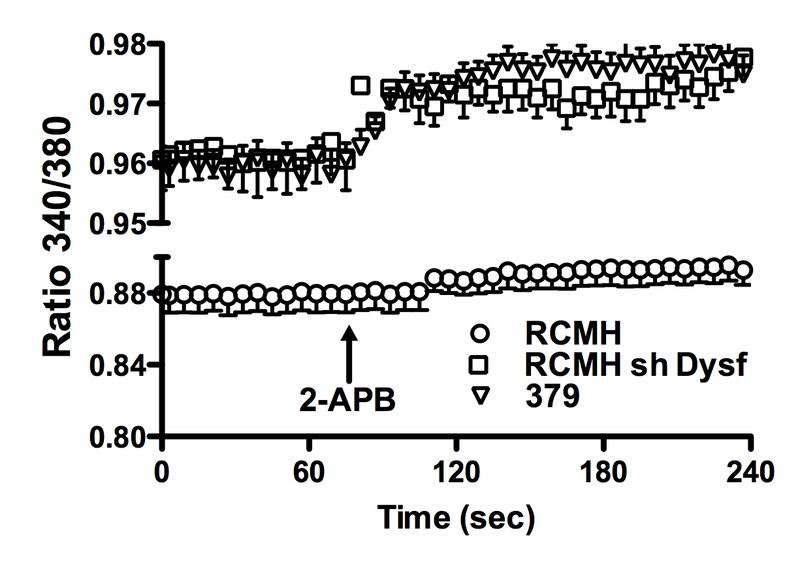 TRPV2 channels were functional in 379 myotubes, as evidenced by their response to stimulation with 2-aminoethoxydiphenyl borate (2-APB), a selective TRPV2 agonist , which induces a sustained increase in Ca2+ levels (Additional file 1: Figure S1). To demonstrate that the absence of dysferlin, regardless of the type of mutation, can induce the expression of connexins in normal human myotubes, we knocked-down expression of dysferlin in RCMH cells by transfecting a small hairpin RNA specific for dysferlin, and transfected cells were subsequently differentiated to myotubes (RCMH-sh Dysf). In the absence of dysferlin, RCMH cells express connexins 40.1, 43 and 45 (green signal), which were in control myotubes (RCMH) that express dysferlin (red signal, Fig. 5). Because Cx proteins are present in dysferlin-mutated myotubes (Fig. 4), we analyzed whether these proteins were indeed forming functional hemichannels (Cx HCs) in these cells. Hemichannel activity was evaluated by ethidium (Etd+) uptake assays , which revealed that HDMM demonstrated elevated Etd+ uptake compared with control myotubes (Fig. 6). We detected a 4-fold increment in the 107 and 379 cell lines, compared with RCMH, whereas AB320 and ER (human dysferlin-mutated cell lines, see methods) showed an increment of 2-fold compared to RCMH. Etd+ uptake was successfully inhibited with external application of 50 μM carbenoxolone (Fig. 5a), a Cx HC inhibitor . In addition, we observed that different dysferlin mutations exhibit different Cx HC activity. Indeed, cell lines 107 and 379 presented the highest Cx HC activity (Fig. 6b). In addition, RCMH myotubes where dysferlin was silenced via specific small hairpin RNA resulted in the expression of functional Cx HCs to levels comparable to 107 and 379 myotubes (Fig. 6b). Considering that Ca2+ influx is reportedly increased in human muscles bearing dysferlin mutations , and that human dysferlin-mutated myotubes express functional Cx HCs (Fig. 6), which in turn are non-selective permeable Ca2+channels , we analyzed basal cytosolic Ca2+ levels in the dysferlin-deficient and control lines using FURA 2-AM assays. Dysferlin-mutated myotubes showed significantly elevated Ca2+ levels compared to control myotubes (Fig. 7), a finding consistent with the increased Cx HC activity observed in the four cell lines evaluated herein. Since Cx HCs were present and the basal intracellular Ca2+ level was elevated in dysferlin-mutated myotubes, we then investigated whether the inhibition of Cx HCs could prevent this phenomenon. Therefore, human dysferlin-mutated myotubes were treated daily for 7 days with 100 nM D4, a selective Cx HC blocker that does not inhibit gap junction channels, thus allowing the fusion of myoblasts to form myotubes where gap junction channels are relevant . Incubation with D4 significantly reverted the intracellular basal Ca2+ signals to values comparable to those of control cells (Fig. 7), suggesting that these channels are responsible of this response. In the present report, we have demonstrated that muscles from patients diagnosed with dysferlinopathy express Cxs 40.1, 43 and 45 at the plasma membrane. Additionally, four immortalized muscle cell lines generated from muscle samples of dysferlinopathy patients also expressed these Cxs, which in turn, formed functional Cx-based hemichannels. This phenomenon was also induced in control myotubes (RCMH, which normally do not express Cxs), after decreasing dysferlin expression through the transfection (in myoblast stage) of a specific small hairpin RNA against dysferlin. Moreover, human dysferlin-mutated 107 and 379 myotubes expressed two additionals Ca2+ permeable channels, the TRPV2 channel and P2X7 receptor. These myotubes also exhibited greater Cx HC activity, and such an elevated Cx HC activity could explain the presence of these channels in the myotubes, which in turn could also contribute to the elevated intracellular Ca2+ signal previously reported in dysferlin KO skeletal muscle fibers  and confirmed here in our model. Anyway, it seems that the presence of Cx HCs is sufficient to explain the elevated basal intracellular Ca2+ levels in dysferlin-deficient myocytes, especially if we consider that the specific inhibition of these channels with a selective blocker (molecule D4), was enough to reduce the elevated basal Ca2+ concentration to levels similar to those of control cells. The mechanisms regulating Ca2+ in myotubes, such as the Na+/Ca2+ exchanger, Ca2+ binding proteins and most importantly the sarcoplasmic/endoplasmic reticulum Ca2+ ATPases (SERCA), are extremely efficient in controlling the cytosolic levels of this cation . Even so, integration of Cx hemichannels into the plasma membrane increased the basal Ca2+ concentration by ~8 %, which may be enough to alter cellular homeostasis of myocytes. This increment in Ca2+ levels could be enough to alter the cellular homeostasis of the myocytes. Indeed, an altered cytosolic Ca2+ level could induce several changes in the myotubes, including an increased proteolytic activity , which occurs in muscles from patients bearing dysferlin mutations . The latter could then drive atrophy in affected muscles, and also to cause the degeneration of muscles by apoptosis or necrosis . These findings have been previously observed in Duchenne muscular dystrophy were resting Ca2+ levels in human DMD myotubes were increased compared with normal myotubes . Therefore, in addition to the deficit in membrane repair mechanism found in dysferlin-mutated myofibers , we propose herein a second pathological mechanism as a consequence of dysferlin mutations, which involves Cx HCs. These non-selective channels could explain several of the reported features in dysferlin-deficient muscles, including the increased membrane permeability , higher proteasome activity [26, 28], activation of inflammation signals [8–10] and muscle degeneration . The latter interpretation is supported by prior reports showing the role of Cx HC in altered membrane permeability and atrophy of skeletal muscles induced by denervation [11, 12]. Although the mechanism responsible of the induction of connexins by the absence of dysferlin still remains to be elucidated, the fact that the knock-down of dysferlin induces the de novo expression of functional connexin-based hemichannels suggests a direct relation between the absence of dysferlin and the presence of connexin. However, it has been demonstrated that some conditions such as inflammation induces the expression of functional connexin-based hemichannels in skeletal muscles through proinflammatory cytokines and the transcription factor NFκB [11, 12]. Inflammation has been described as a key feature in dysferlin-mutated skeletal muscles . Whether the induction of Cx HC involves an activation of NFκB still needs to be investigated. In this study, we have demonstrated the presence of connexins 40.1, 43 and 45 in muscular biopsies of patients with different dysferlin mutations. This was confirmed in myotubes derived from cell lines of human dysferlinopathy patients, as well as in normal myotubes where dysferlin was knocked down. The Cxs expressed formed functional connexin based hemichannels, that are responsible of elevated basal intracellular Ca2+ levels in human myotubes. The presence of these channels may represent a novel pathological mechanism in dysferlinopathies, as well as a most attractive therapeutical target, considering their localization at the membrane level. Anti-rabbit or anti-mouse IgG antibodies-conjugated to Cy2 (green) or Cy3 (red) were purchased from Jackson immunoresearch laboratories (West Grove, PA, USA). Ethidium (Etd+) bromide was from GIBCO/BRL (Grand Island, NY, USA), fluoromount-G was from Electron Microscopy Science (Hatfield, PA, USA), Previously described polyclonal anti-Cx40.1, -43, and -Cx45 antibodies were used . Synthesis and characterization of D4 molecule will be published elsewhere. The protocol used was obtained from Philippi et al. . Briefly, primary myoblasts isolated by protease digestion were obtained from fresh muscle biopsies and expanded at 37 °C in skeletal muscle growth medium (PromoCell, Heidelberg, Germany) supplemented with 10 % FCS (Gibco, Paisely, UK). The cultures were enriched in myoblasts by immuno-magnetic cell sorting using anti-CD56/NCAM antibody coated magnetic beads (Miltenyi Biotech, Bergisch Gladbach, Germany). Purity of the myoblast preparation was verified by staining with an anti-desmin antibody (DAKO) revealing more than 95 % desmin-positive cells. Primary human dysferlin-deficient myoblast lines were transduced with pBABE retroviral vectors carrying Cdk4 and hTERT. Puromycin and neomycin were used as selection markers, respectively and isolation of individual myogenic clones was carried out as described by Mamchaoui et al. . The immortalized dysferlin-deficient human myoblast lines were cultured in growth medium consisting of 1 vol 199 Medium (Invitrogen, Carlsbad, CA)/4 vol DMEM (Invitrogen) supplemented with 20 % foetal calf serum (Invitrogen), 2.5 ng/ml HGF (Invitrogen), 0.1 μM Dexamethasone (Sigma-Aldrich, St. Louis, MO) and 50 μg/ml Gentamycin (Invitrogen). Differentiation into myotubes was initiated at approximately 90 % confluence by cultivation in differentiation medium (DMEM/F12, 5 % horse serum, insulin 10 μg/ml) for 14 days. Four different dysferlin-mutated myoblast lines were generated and called 107, 379, AB320 and ER, each one bearing a different dysferlin mutation as follow: 107, c.855 + 1delG c.895G > A; 379, c.1448C > A c.107 T > A; AB320, c.342-1G > A HTZ c.3516_3517delTT (p.Ser1173X) HTZ; ER, G1628R(c.4882G > A)HMZ. Basal intracellular Ca2+ signals were evaluated in myotubes by using the ratiometric dye FURA 2-AM. The myotubes were incubated in Krebs-Ringer buffer (in mM: 145 NaCl, 5 KCl, 3 CaCl2, 1 MgCl2, 5.6 glucose, 10 HEPES-Na, pH7.4) containing FURA2-AM dye (2 μM) during 55 min at room temperature. Then, the Ca2+ signal was evaluated in a Nikon Eclipse Ti microscope equipped with epifluorescence illumination, and images were obtained by using a Clara camera (Andor), at 2 wavelength (λ) 340 and 380 nm, calculating the ratio 340 vs 380. The uptake of ethidium (Etd+) was evaluated by using time lapse measurements. Human myotubes plated onto glass cover slips were washed twice with Krebs-buffer solution. For time lapse measurements myotubes were incubated in Krebs buffer solution containing 5 μM Etd+ bromide. Etd+ fluorescence was recorded in regions of interest located in nuclei of the myofibers. An epifluorescence Nikon Ti microscope was used. Images were captured with a Clara camera (Andor) every 30 s. Image processing was performed off-line with ImageJ software (NIH, Bethesda, USA). To detect different proteins in myotubes or cross sections (10 μm) of muscles (fast frozen with iso-methyl-butane cooled in liquid nitrogen) samples were obtained and processed as described previously . Briefly, samples were fixed in paraformaldehyde 4 % by 5 min, then incubated at 4 °C for 12 h with diluted primary anti-Cx40.1 (1:100), anti-Cx43 (1:250), anti-Cx45 (1:250), anti-Panx1 (1:300), anti-TRPV2 (1:100) or anti-P2X7 (1:100) antibodies followed by 4 washes with PBS 1X and then, incubated with an appropriate dilution of alexa488-conjugated goat anti-rabbit or anti-mouse IgG antibodies. Samples were rinsed with PBS 1X, mounted with fluoromount G containing DAPI on glass slides and representative images were acquired in an epifluorescence microscope Nikon Ti (Tokio, Japan). Commercial small hairpin RNA plasmid against dysferlin (Santa Cruz Biotech, Dallas, Tx), with puromycin resistance, was used to transfect RCMH myoblast through lypofectamine method . The silencing of dysferlin was confirmed by western blot analysis. Following ethical guidelines, healthy volunteers and dysferlinopathy patients who participated in this study signed an informed consent approved by the local Ethics Committee in accordance with the ethical standards laid down in the 1964 Declaration of Helsinki and its later amendments. Diagnosis of dysferlinopathy was achieved based on clinical examination, muscular biopsy and mutation analysis. The mutations of the patients are published in Woudt et al. . Results are presented as mean ± standard error (SE). For multiple comparisons with a single control, a non-parametric one-way ANOVA followed by the Dunn’s multiple comparison test was used. Analyses were carried out using GRAPHPAD software. P < 0.05 was considered statistically significant. We thanks to Ms. Alejandra Trangulao for her technical support and to Dr. S. Spuler for providing the initial material from patients for develop of the cell lines 107, 379, AB320 and ER. Publication of this article was partially funded by CONICYT/PAI (Chile) Proyecto de Inserción en la Academia grant 79140023 (to LAC); CONICYT/PIA (Chile) Rings grant ACT 1121 (to PC, JAB, AMC,); Fondo Nacional de Desarrollo Científico y Tecnológico (FONDECYT) grant 1151383 (to JAB); FONDECYT grant 1150291 (to JCS); ICM-Economía P09-022-F Centro Interdisciplinario de Neurociencias de Valparaíso (to JCS); Association Française contre les Myopathies (AFM) and the jain foundation (to AB and VM). PC, declares patent protection for the RCMH cell line. LAC, JAB, CA, AMC, AB, VM and JCS, declare no financial and non-financial competing interests. LAC designed research, performed experiments, analyzed data and wrote the paper. JAB, CA, AMC, AB, VM, JCS and PC designed research, analyzed the data, and wrote the paper. All authors read and approved the final manuscript.